Growing your Direct Mail Response is a major goal of every direct marketer. The USPS delivers 506 million mailers per day. We ask Grandma Ray what she received in her mailbox today and let her tell us about how she responds to it. “In today’s mailbox were two pieces of advertising. One was an envelope from some bank that I threw in the trash right away along with some clothing catalogs. The bank probably wants to lend me money or offer a credit card. 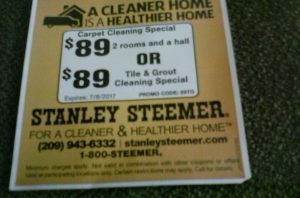 I also got a big, glossy, double sided postcard from Stanley Steemer. I have new carpets and the furniture doesn’t need a shampoo, but the shock of bright yellow-gold and the offer of $35 off any cleaning service is hard to toss. There are some little before and after photos to study along with pictures of fun ways to get dirty – and Stanley Steemer will clean it for you when it’s tracked inside. “I’ve had Save Mart coupons burning a hole in my pocket for a week. 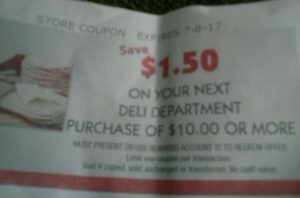 With my Save Mart customer card I could save $1 off any paper towel and $2 off any frozen food. Plus I had $1 off any purchase on that same card. I couldn’t wait!